One week into November and approximately a million internet years behind every one else, I’ve got something with pumpkin! I couldn’t join the pumpkin everything rush just because it turned October and suddenly even the weird, modernist cube mansions up the hill had artisanal gourds crowding the front steps. I had to wait until I was ready, until it was pumpkin season in my heart. And finally, this past weekend, the weather turned on a dime from Summer to glorious Fall. And I mean real, crisp-aired, East Coast-style Fall, with brilliant blue skies and temperatures hovering just below comfortable and just above too-cold-for-my-trendy-velvet-bomber-jacket. It was beautiful, and will be short-lived, I’m sure. However, I can keep that feeling going today, with this flaky, pumpkin-filled tart. It only requires two(!) ingredients, three if you want to do an egg wash, and could really not be simpler to do. 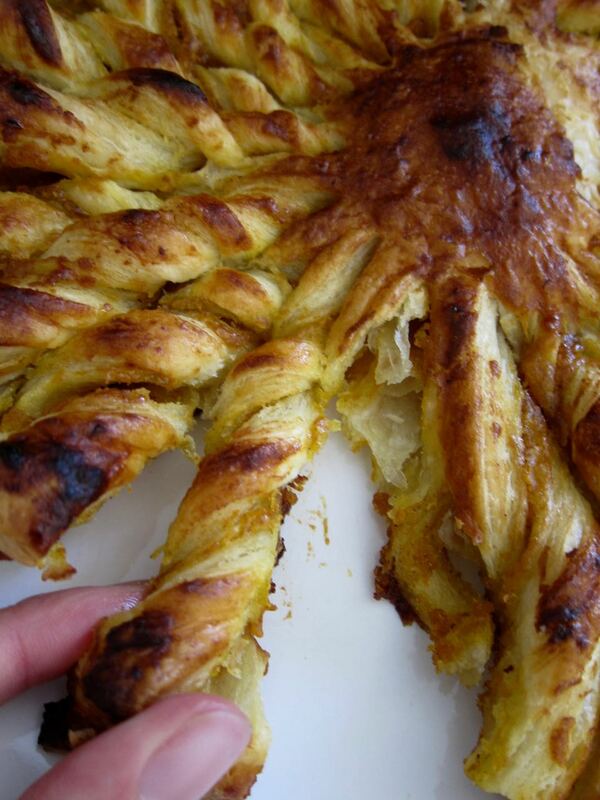 You take your puff pastry, fill it with some pumpkin butter, top with more puff pastry, cut and twist it into strips, and bake it up until it puffs into a golden sun. It’s cozy and buttery and just the thing for lazy mornings on the couch or around a table. Just make sure you wear your comfy pants and show up with a giant mug of something hot. Heat oven to 425 degrees. 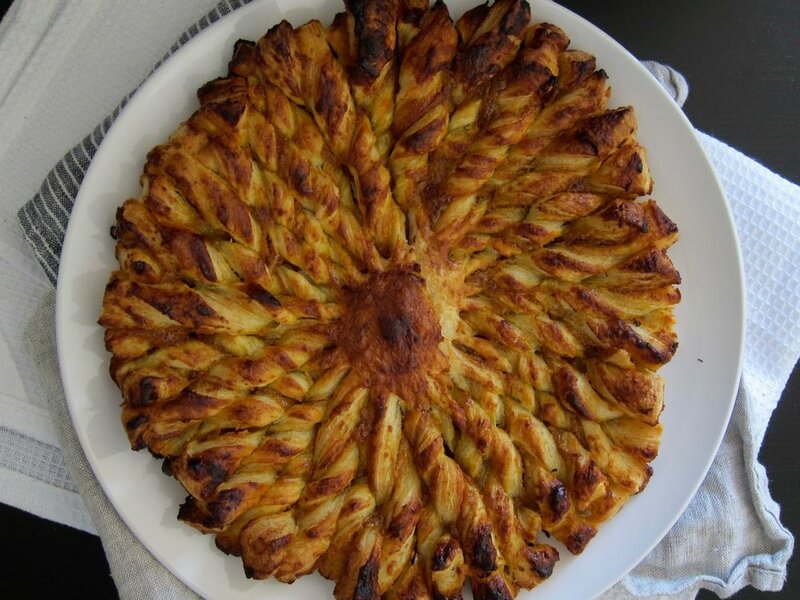 Roll out puff pastry to two, 10-12 inch circles (make sure the circles are the same size). Slide one circle onto a parchment lined baking sheet and spread with pumpkin butter in a thin layer, then top with the second circle of puff pastry. 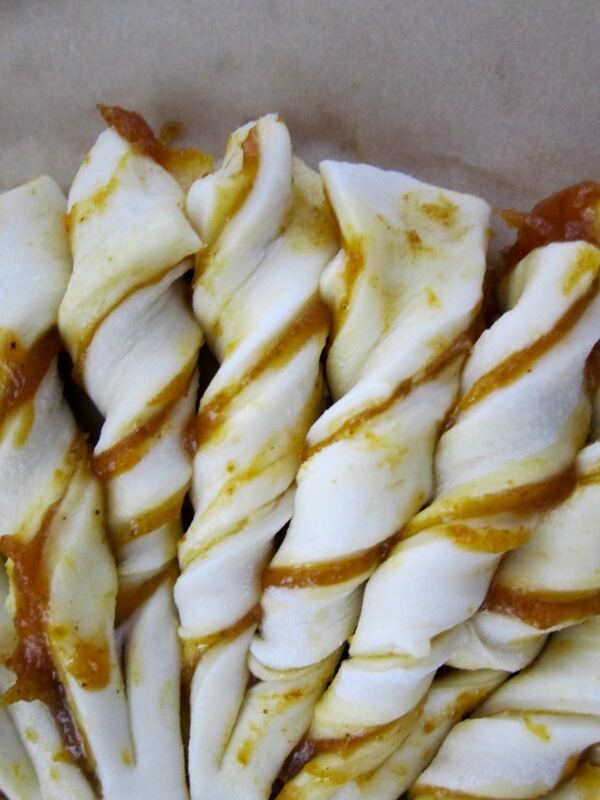 Use as much as you like, but remember the more you fill your pastry with the messier it will be to twist. Place a champagne flute or small glass upside down in the center of the pastry and cut lines away from the glass, so you end up with 32 equal wedges. This is easy to do by cutting the circle into quarters, then dividing each quarter in half, then again, etc, until you get to 32 (4,8,16,32). 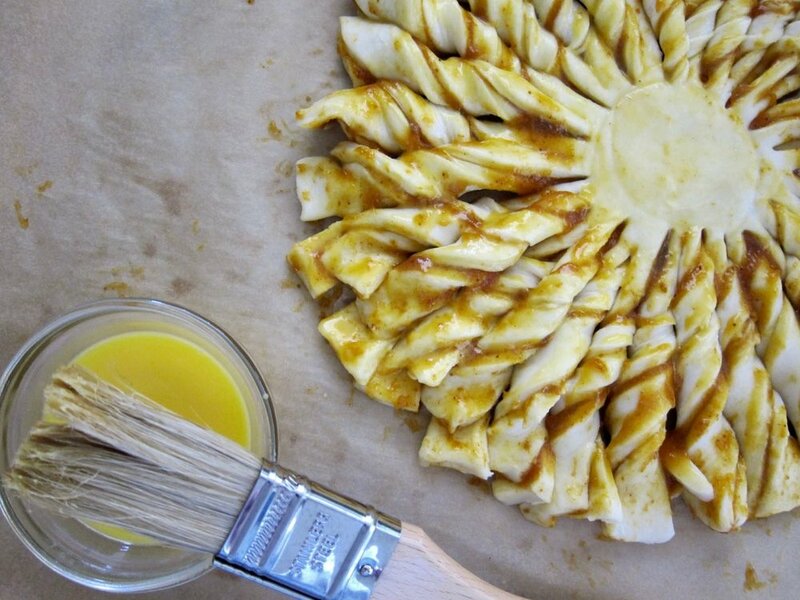 Twist each wedge very gently so it spirals out from the center. You may need to put the pastry back in the freezer to firm up a bit first if it has softened too much while cutting. Mix the egg yolk and water together in a small bowl and brush over top of the pastry. Bake at 425 for 10 minutes, then lower the heat to 375 and bake another 20 minutes, until puffed and crispy. Serve warm or at room temperature, dusted with powdered sugar if you want to get extra fun (I didn't).